Chewbacca is a Star Wars minifigure that was introduced in the set 3342 Star Wars 3, released in 2000. The first variation of Chewbacca, this one came in old brown. It is made up of an all brown torso and legs, with a unique piece for his head that also extends down to his chest and back. This piece is the one used to represent his thick fur and the bandolier he wears. The face of the piece has indentations for the eyes that are nearly always in shadow, making paint unnecessary, a nose tipped in black and a mouth, both of which jut out slightly, making the piece, and therefore the minifigure, an extremely accurate representation of Chewbacca. The second variation of Chewbacca is nearly identical to the first, the difference being a slight change in colour; this version is reddish brown. 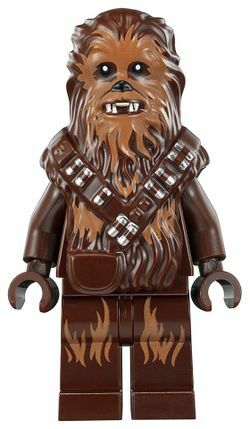 The microfigure Chewbacca is old brown with some lighter brown printing in the shape of tufts of fur. The grey and black bandolier is printed across his chest, starting at his left shoulder and ending at his right hip. His mouth is open and the teeth bared in a snarl. Meanwhile, "Chewbacca (Twon Ketee)" also has "Can bypass Toxic areas". Chewbacca, also known as "Chewie", was a Wookiee, a physically intimidating, tree dwelling race, who was a good friend of Jedi Master Yoda, and along with Tarfful helped him escape from the Clone Troopers on Kashyyyk during Order 66. Afterwards, he fought against the Galactic Empire for the liberation of Kashyyyk, but was captured. Released by Han Solo, to whom he owed a life debt, he eventually became a long-time companion of the smuggler, and the co-pilot of the Millennium Falcon. Later he and Han join the Rebellion and participated in many battles along with Luke Skywalker, Princess Leia, R2-D2 and C-3PO that led to the eventual destruction of the Galactic Empire. After the defeat of the Empire, Chewbacca continued as a smuggler alongside Han Solo, until Han's death. Afterwards, Chewbacca joined the resistance and their attempts to thwart the First Order. This page was last edited on 14 February 2018, at 22:57.